Gay MP candidate Atik answered our questions: For equal citizenship! 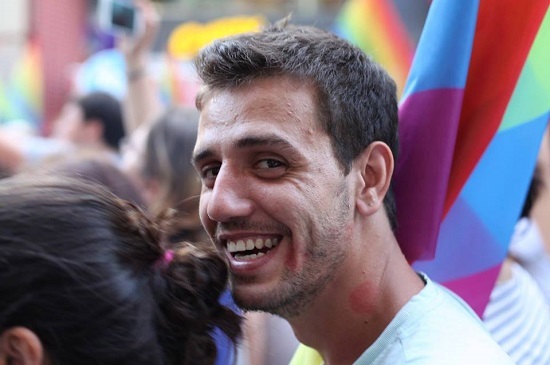 Hasan Atik, an LGBTI+ rights advocate running for a seat in the Turkish Parliament as the 4th candidate in Edirne on the ballot list from the People’s Democratic Party answered Kaos GL’s questions. How did you decide to become a candidate? Was your candidacy as a gay politician in HDP supported? I have assumed duties in various levels of HDP. In every position I have worked in complete harmony with my party and my colleagues. HDP exists in all colors. When I decided to apply for the candidacy, my fellow party members supported me both at the centre of the party and in local branches and they continue to support me. You are running for a seat in the parliament from a place which will not elect you. Yet, as far as we know, you are the only open gay candidate. What are your plans for the election campaigns? It was my request to be a candidate from Edirne. I believe I can be more beneficial for my party in Edirne. No member of HDP is in this election just for a seat, we care about our party. I will continue rights advocacy during the election campaign. I will continue to work for equal citizenship not only for one identity but for all identities. For me, my candidacy is not a means to an end but the end itself; the aim for equal and free citizenship for all peoples of Turkey. Unfortunately, we live in a country where LGBTI+ rights are not maintained. As an MP candidate, what are your demands regarding the LGBTI+ rights? Our most urgent demand is the right to live. Equal citizenship, freedom, equality in access to accommodation and employment are also among are demands. I will fight for the legal recognition of hate crime. I will be a strong defender for our demand to live not underdiscrimination but under equal citizenship. Aside from LGBTI+ rights advocacy, you also advocate for HIV/AIDS related rights and give counseling on the matter. How will you carry this struggle of yours to political arena? HIV/AIDS is a pressing matter in Turkey. The state does not have a preventive approach, aside from providing treatment. We will first fight to have sexual health training in the national education syllabi. Then we will educate the society against HIV-phobia. We will fight against stigmatization and discrimination, which are dominant tendencies in Turkey. Our purpose is to ensure that the Turkish state belongs to everyone living inside our borders. We aim to govern this country by sharing our authority with all segments of the society, all peoples of Turkey. Together, we will rebuild Turkey into a more democratic and livable country. We will win.